BASSETERRE, St. Kitts– Two days before what would have been her high school graduation, the remains of murder victim 17-year-old Leanna ‘Tiney’ Napoleon of the Basseterre High School (BHS) was laid to rest on Monday 26th June. Scores of BHS students were among the mourners who took part in a funeral service honouring the life of the school girl whose body was discovered in the Olivees mountain nearly two weeks before. She had been missing for more than a month. The funeral ceremony was held at the Zion Moravian Church located on Victoria Road followed by the burial at the Springfield Cemetery. Dignitaries present included: Prime Minister and Minister of National Security Dr. Timothy Harris and Dr. Timothy Harris; Deputy Prime Minister Hon.Shawn Richards; immediate former Prime Minister and Opposition Leader of the St.Kitts-Nevis Labour Party the Rt. Hon. Dr. Denzil L. Douglas and his colleagues Parliamentary Representative for Constituency Three Hon. Konris Maynard and caretaker for Constituency Eight Dr. Terrance Drew. The annual BHS graduation ceremony was held on Wednesday 28th June at the St. George’s Anglican Church on Cayon Street. 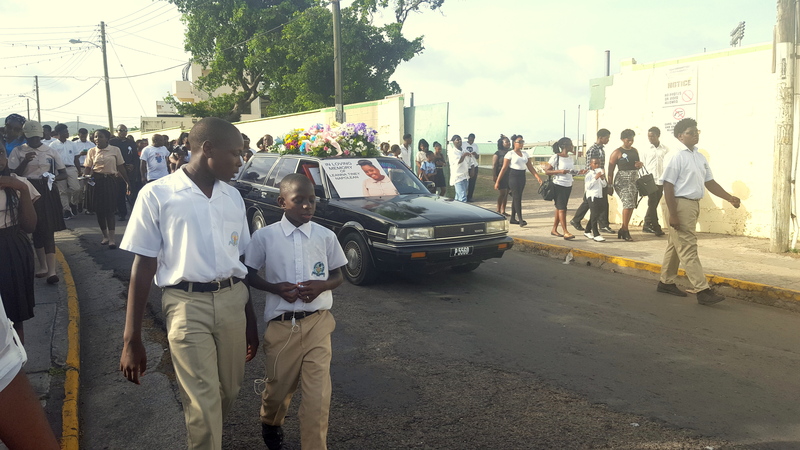 “Wicked set a boys” and “Wha dey Kill off de girl for?” were the type of sentiments expressed by onlookers as the solemn procession made its way through the streets of Basseterre towards the cemetery Monday afternoon. On the bittersweet flipside, it was a general thought shared by many individuals that at least teen’s family has had the opportunity to get some closure by conducting a proper funeral service. Napoleon was last seen alive on Monday 8th May in the areas of Buckley’s Site and Fort Street. Her death was the 15th recorded homicide for 2017 out of the current count of 16. Last Wednesday (21st June), a candle light vigil was held in tribute to Napoleon at the school’s Taylor’s Range compound. Principal Maurice Benjamin in speaking about death as being a natural consequence of life said Napoleon has departed in an unnatural way.